It seems as if almost every skincare brand offers a cleansing oil, so you’re likely curious about how they work and who should use one. Cleansing oils, especially those formulated to be easy to rinse, can be a wonderful addition to your skincare routine, whether used alone or as part of a double cleanse. Cleansing oils are another option to remove makeup, surface debris, and excess oil. What makes them different is how they work compared to traditional water-soluble cleansers that have a cream, gel, or foaming texture. Traditional cleansers cleanse primarily with surfactants, ingredients that interact with oil, makeup, and surface debris on skin in a manner that allows them to be rinsed with water. Well-formulated cleansers also deposit hydrating ingredients on skin so it feels smooth and soft rather than tight or dry. Many cleansing oils also contain surfactants, but the surfactants are not the stars of the show; rather, the oils take center stage. How Do Oils Cleanse Skin? Oils don’t just moisturise skin, they also work as solvents, a group of ingredients that can dissolve similar substances. Oils are a special type of solvent because they’re lipophilic, meaning they’re naturally attracted to other oils, including the sebum our skin produces and the oil-like ingredients in makeup. This is what allows the oils in a cleansing oil to quickly dissolve makeup and excess oil while softening skin at the same time. The surfactants and a type of ingredient known as an emulsifier then come into play, as these allow the oils and what they’ve dissolved to combine with and then be easily rinsed with water. Provide for quick and easy removal of all types of makeup and sunscreens. Leave skin feeling supple and smooth. Are compatible with any other type of cleanser should you choose to double cleanse. The best cleansing oils for skin contain non-fragrant plant oils. These are rich in components known as glycerides, which multitask by removing what you don’t want to stay on skin all night (makeup and sunscreen) while also replenishing what skin needs more of, namely, skin-softening hydrators. Who is a Cleansing Oil Best For? 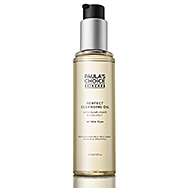 All skin types can use a cleansing oil formulated to be rinseable with water and not leave an oily residue. Whether or not you should use a cleansing oil comes down to two things: personal preference and how much long-wearing makeup you use. A good cleansing oil can negate the need for a separate makeup remover, thus getting the job done faster. Who is a Cleansing Oil NOT For? Assuming the cleansing oil doesn’t contain problematic ingredients like fragrance (including fragrant essential oils), they’re not the wrong choice for anyone, including those with sensitive, redness-prone, or even blemish-prone skin. There’s one exception: Cleansing oils that are composed of a single oil or oil blend without surfactants or emulsifiers are not recommended for combination to oily skin, as they only add to skin’s oiliness issues. Using a cleansing oil is the same as using a regular cleanser: Apply a small amount to wet skin, gently massage over the face and eye area, rinse thoroughly, and pat skin dry with a soft, clean towel. However, some cleansing oils work best applied to dry skin, and then you either rinse with water or splash with water and work the oil into a milky emulsion before rinsing. Consult the directions on the cleansing oil you’re considering, but feel free to experiment to see which method works best for you.